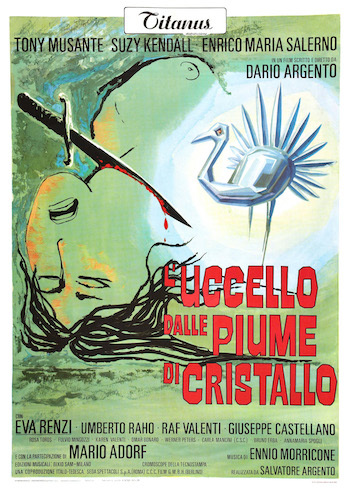 In Dario Argento’s first film, Tony Musante plays Sam, an American writer who is in Rome trying to find inspiration for a new work. Apparently all the inspiration he was able to muster up was a work-for-hire project about birds. He turns in that project and is getting ready to leave the country, when, wouldn’t you know it, he happens to be aimlessly walking the nighttime streets of Rome and sees an attempted murder going on! To be fair, no one could have missed it because it was taking place in a modern (for 1969) art gallery where the entire storefront of the place is one giant, brightly lit picture window. Sam pounds on the window trying to get the attention of the people inside. But no one is listening (“We’re trying to have a murder in here! Do you mind?”) and all he can do is watch helplessly as this poor Italian dish is attacked. Sam continues to be harassed by the cops and they take his passport away and tell him he’s not going anywhere until the case is solved. Now, since they already live in Italy, it doesn’t really bother them if the case is slow in being cracked, but since Sam is from California, he decides he better start investigating on his own. One drawback: the killer calls up Sam’s gal and threatens to kill her if Sam doesn’t get off the case. It’s always something isn’t it? Sam’s investigative techniques leave a little something to be desired. It involves him questioning an imprisoned, stuttering pimp and that leads him to a guy in a yellow raincoat. This guy in the yellow raincoat chases Sam through Rome in the middle of the night while trying to kill him and then Sam starts to chase him but loses him because there is a convention in town for guys in yellow raincoats. Who knew? You can tell he’s obsessed because he pastes the newspaper articles of the killings on the walls in his house. I never understood how cases could be solved simply by tacking up all the pictures and news clippings of a crime. Like if you let your eyes lose their focus a bit when staring at all that crap then the killer’s face will come into view or something. There was supposed to be some black comedy in this movie and I guess it was supposed to be supplied by the eccentric artist that Sam goes to visit in the course of his investigation. There was some painting related to the killer and Sam finds the artist to speak with him and he lives in an old barn with all these cats. The artist gives Sam some dinner and then it comes out that the artist keeps all the cats for food. Whoa! Sam ate a cat! How icky! Pretty funny stuff. By the way, I never did figure out what the point of the conversation with was. It sure didn’t help Sam solve the murder spree. Plus he was probably burping up hairballs the rest of the day! Meanwhile, his girlfriend is getting terrorized by the killer. The killer is trying to get her at her house and she just runs around in the dark screaming and whimpering while the killer tries to break in. Then we cut to the next morning and she’s okay and Sam is back and I’m not really sure what went down with the whole killer trying to get in the house bit. This illustrates the movie’s main problem and that is a lack of clarity. Some scenes just don’t seem to follow from the ones that went before it and some scenes seem to serve little if any purpose at all like the cat-eating artist scene. A good portion of the movie is devoted to Sam’s investigation of the killings but Sam’s investigative efforts aren’t illuminating at all. He runs around, checks some stuff out, gets in some danger, gets out of some danger and that’s about it. Since this is a thriller, you are guaranteed a double-cross shock ending and that is exactly what you get with this movie. Now about ten minutes from the actual end of the film, the dude that you just know is the killer falls out of his seventh floor window to his death. Pretty sweet way to solve a case, right? Not so fast, my friend. You see there was someone else with this guy. A certain someone Sam saw before, way back, at the very beginning. A certain someone who is now mysteriously missing. A certain someone who may have been the reason why the attempted murder he first witnessed didn’t seem quite right. The film is notable for being the prototype slasher flick, maybe even more so than Psycho. Norman Bates was never really proactive. Sure if you showed up at his hotel, he’d stab the piss out of you, but he didn’t go out hunting. In this movie the killer hunted the victims down in the streets and where they lived. That’s more the style of the modern day movie maniac than Norman was. I’m also guessing that all these modern day slasher movies borrowed the whole “muddled plot with preposterous finish” from this film as well.